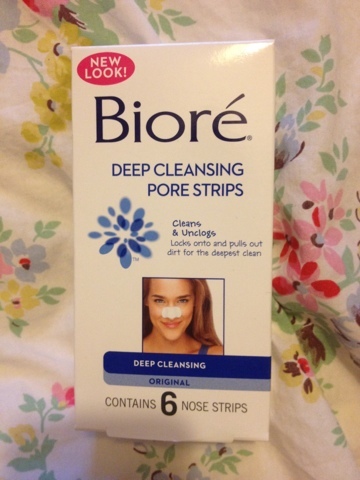 So another of the Biore Products that I was sent to review here, and this one is Deep Cleansing Pore Strips, I have to say until I went to try these I hadn't really paid attention to the black heads on my nose, It was only when I got up close in my magnifying mirror that I noticed them, there aren't many and they didn't massively bother me - until I used this and saw how much dirt it pulled out which was kind of gross but rather satisfying at the same time. These come in a box of six and are recommended to be used once a week to remove the weeks build up of dirt. As this was my first time using these, it didn't get rid of everything, I can still see a few blackheads on my nose, but I know from looking at the strip after that it has definitely removed some of them and I think that with a few more uses it will get rid of the remainder of the dirt build up. They also come in individual little packets, really handy for going away! You apply these by wetting your nose and then peeling the see through plastic off and sticking to the nose so it drys to the skin, it takes about 10 - 15 minutes for the strip to set and it does feel a little weird as it dries and sets, almost a little tickly, I don't know whether it was this or the excitement of seeing what dirt it got out that made me pull it off after ten minutes. It's definitely quite a strange feeling. Have you used these strips or can you recommend any others? 1 comment on "Biore Deep Cleansing Pore Strips - Original"